Dinner tonight was really yummy! 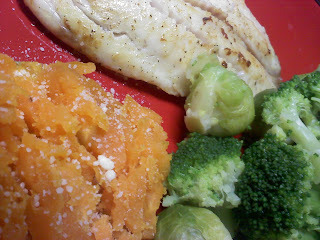 I had some boiled broccoli and brussel sprouts, half a sweet potato with a pinch of parmesan cheese, and a piece of freshwater tilapia. To cook the tilapia I sprayed it with no calorie vegetable spray and tossed it with kosher salt, black pepper and lemon pepper. I heated up a griddle to 350 degrees and cooked the tilapia for 5 minutes on each side.